Law Enforcement Torch Run Breaks $3 Million Mark! The Law Enforcement Torch Run (LETR) for Special Olympics Illinois is coming off a great year in 2013 breaking the long-anticipated goal of raising more than $3 million in a single year. In fact, they ran right past the magic number, raising $3.3 million, an increase from $2.97 million in 2012. And, they are committed to carrying that momentum forward in 2014. The leaders of the Torch Run in Illinois, Eric Smith and Tom Reasoner, lay the credit for the movement’s success squarely on the shoulders of the dedicated departments around the state, the LETR State Committee and Special Olympics Illinois staff, in collaboration with partners like Dunkin’ Donuts, Shop ‘n Save and Texas Roadhouse. 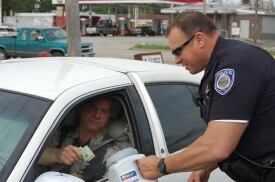 Read about 2013’s top-fundraising department – the Maple Park Police Department. Indeed, focusing on growing key events like the Tip-A-Cops, Cop on Top and Plane Pull resulted in a near doubling in participation and fundraising over 2012, says Matt Johnson, SOILL Senior Director of Development – Torch Run. “Everything came together in 2013 for a perfect storm,” he said. And, they’re looking for the momentum of that storm to carry them forward in 2014. “The Kick-off Conference (on Feb. 7 in Bloomington) will be a great start to the year,” said Smith, by inspiring attendees and increasing new department involvement. “The focus is to not only maintain our success, but to recruit new departments to start raising money with small events and grow the program,” said Smith, LETR Director and Chief of Sherman PD. 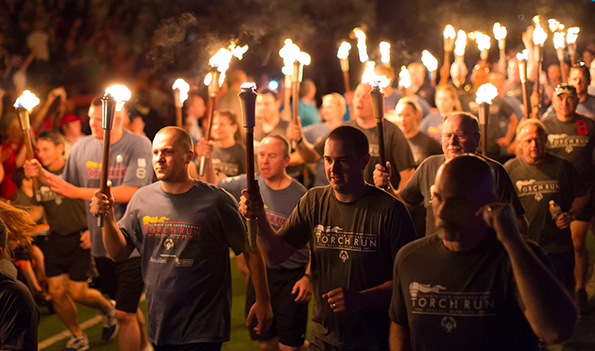 Widening the reach of the Torch Run movement is key to carrying it forward, said Reasoner, Assistant LETR Director. “Over the past year, we’ve picked up momentum by reaching out to a wider group of participants” such as high school teams at the Plane Pull and teams of educators at Trivia Nights. In fact, a group of students led by Cassie Reever in Kane County initially participated in a fundraising event and have been motivated to begin volunteering with the Torch Run. Smith and Reasoner agree that groups such as service clubs, volunteer groups, educators and youth represent the future of success for the Torch Run. “It’s a win-win situation for the community and Special Olympics,” Reasoner said. Increased awareness of Torch Run and Special Olympics will draw more participants to events, raise more money for Special Olympics and strengthen feelings for law enforcement in the community. “The Law Enforcement Torch Run is a global movement, just like Special Olympics, and growing one will only benefit the other,” said Reasoner.